Russian Orthodox family and upbringing. His father died when Leonid was very young, and he was raised by his mother, Liubova Dimitrievna. He started his studies in the Orthodox seminary in 1901, but in 1902 he left, travelled to Rome, Italy, and converted to Catholicism. Studied at Anagni and Rome, and the Freiburg, Germany. Assisted at the coronation of Pope Pope Pius X on 9 August 1903. Doctorate in philosophy in 1905; degree in theology in 1907. Deacon on 22 March 1911, and ordained a Greek Catholic priest on 25 March 1911 in Bosnia. Monk at the Studite monastery in Bosnia, beginning his noviate on 20 May 1912 and admitted to the habit on 12 February 1913, taking the name Father Leontios. He returned to Saint Petersburg and was immediately arrested for his faith, and sent to Siberia. Released in March 1917 during an amnesty for political and religious prisoners, he returned to Saint Petersburg, and was appointed Exarch of the Russian Greek Catholic Church. The Communist takeover later that year began a period of persecution of the faith and the faithful, with 1922 ushering in the era of violent suppression of Christianity. All churches were ordered closed on 5 December 1922. Father Leontios and fourteen priests were arrested for their faith in January 1923, sent to Moscow for trial; sentenced to ten years exile to Solovky and Vladka. Released in 1926, he relocated to Kaluga. Arrested again for spreading the faith, he was sentenced to ten years in Solovetsky where a large monastery had been converted to a prison. There he continued to minister to the faithful, conducting covert Masses, using wine made from raisins sent by the families of prisoners. Transferred to forced labour camp at Pinega on 6 August 1929 where he was billeted with an imprisoned Orthodox priest; after work, Leontios conducted catechism class for local boys. Transferred to Arkhangelsk, to Kotlas, and to Poltava. The poor conditions and steady overwork broke his health, and in 1932 he was certified as an invalid. He completed his sentence in 1933, but was barred from returing to many Russian cities, and had to live in exile the rest of his life. One of the Martyrs Under Communism in Eastern Europe. • 7 March 1935 of "natural causes"
Born to a poor family, Siméon felt a call to the priesthood at age ten. He entered the seminary in Mans, France in 1831. Due to health problems, he had to leave seminary for two years during which time he worked as a tutor. Ordained a diocesan priest on 20 May 1837, Father Berneux served as a professor and spiritual director at the Mons seminary. Feeling a call to missionary work, he joined the Paris Foreign Missions Society in 1839, and left for the Asian missions on 13 January 1840. He arrived first in Manila, Philippines before being assigned to the Tonkin region of modern Vietnam on 17 January 1841. He began his work near a small convent outside the town of Moi-yen, learning the Annam language. Arrested on Holy Saturday 1841 during one of the periodic anti–Christian persecutions, Siméon and a brother priest were dragged from place to place, ordered to renounce Christianity, ordered to convince lay people to renounce the faith, and when their persecutors finally realized that the priests would not cooperate, they were sentenced to death on 8 October 1842. However, before the sentence could be officially approved, a French official learned of their imprisonment, and had them released on 7 March 1843. Father Berneux was sent to the Chinese province of Manchuria where he continued his missionary work there for ten years, sometimes in Singapore or Macao. On 5 August 1854 he was chosen the fourth Vicar Apostolic of Korea by Pope Pius IX, and arrived there with some fellow missionaries in early 1856; for administrative reasons he was also appointed titular bishop of Capsa. He learned Korean, spent time on the road visiting rural Christians, started a seminary in Pae-ron, founded several schools, and started a printing house that published Catholic works in Korean. Thousands were baptized during his time as bishop, but a palace coup in 1864 and threats of Russian invasion led to a resurgence in anti-Western, anti–Christian nationalism and official persecution of the Church. Bishop Berneux was arrested on 23 February 1866. He was taken to the capital, and from 3 to 7 March he was repeatedly beaten and interrogated under torture until the bones in his legs were shattered. As he was dragged to his death, Father Siméon preached to the people who had come out to witness the execution, and to remind his fellow sufferers that they died for the kingdom of God. Martyr. Lay-woman born to a noble pagan family. Convert to Christianity. Wife and mother. 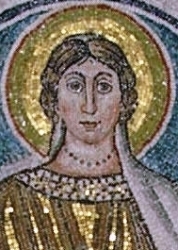 Martyred with her maid, friend, and fellow convert Saint Felicitas. In centuries past, their story was so popular that Saint Augustine of Hippo warned against giving it the weight of Scripture. Born to the Tuscan nobility, the daughter of Count Ignatius Redi and Camilla Billeti. Pious child who saw God in all things, and who was confused to learn that not everyone knew that God loved them. Educated at the Saint Apollonia convent at Florence, Italy from age nine. A gentle and mature child, she was often left in to watch over her peers. Noted for an intense desire for her First Communion, and for a devotion to Our Lady. Had an extensive correspondence with her father, discussing her spiritual life in great detail; she asked that he destroy each letter after reading it, and sadly, he did so. 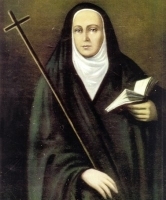 In September 1763 she received a message from Saint Teresa of Jesus advising her to become a Carmelite. Anna went home to Arezzo, Italy at age 17, but returned to Florence almost immediately. 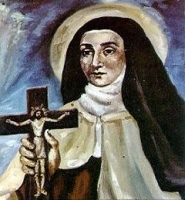 Became a Discalced Carmelite, joining the convent of Saint Teresa on 1 September 1764, and taking the name Teresa Margaret of the Sacred Heart. She received the veil on 11 March 1765, and made her final vows on 12 March 1766. Sister Teresa worked in the convent's infirmary, and appeared to have a gift of healing. She predicted her own death less than five years after making her final vows. Her short life and vocation were spent in contemplative union with God as she ever meditated on her favourite phrase, "God is love." Raised in a pious family, Maria early felt a call to religious life, but as there were no cloistered religious congregations in the region at the time, she simply donned a black robe and moved in with some other women who felt the same call. 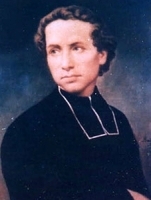 Under the spiritual direction of Jesuit Father Gaspar Juarez, she taught children, cared for the sick and poor, did needlework to help support herself, and assisted at retreats based on the Spiritual Exercises of Saint Ignatius of Loyola. In 1767, King Charles III of Spain expelled the Jesuits; with her spiritual director gone, Maria herself started leading the retreats. She met some hostility as the Exercises are associated with Jesuits, but for years she used them as the basis for retreats in several cities, bringing the message of Christ to tens of thousands of people, and received the support of Archbishop Sebastián Malvar y Pinto of Buenos Aires. Founded the Daughters of the Divine Savior and a retreat house in Buenos Aires which continues its good work over two centuries later. Born to the nobility, he was well educated, and earned a degree in Lyon, France in 1856. Simon entered the Sulpician seminary in Paris, France in 1859. He joined the Paris Foreign Missions Society, and began studying at their seminary on 25 July 1861. Ordained on 21 May 1864. Assigned to Korea, it took ten months of travel before he was able to sneak into the country on 29 May 1865 to begin ministering to Christians during a period of persecution. Worked with Saint Siméon-François Berneux. Arrested on 26 February 1866, he was imprisoned, tortured and martyred with his bishop and two brother priests. Lifelong layman in the apostolic vicariate of Korea. Well educated, he embarked at an early age on a career in civil service, and by age 39 was a regional governor. However, John had trouble reconciling his official duties with his Christianity, and he finally resigned in order to work with missionaries, teaching them the Korean language. He moved to Seoul and earned his living teaching Chinese literature to the children of high officials. With increasing fears of a Russian invasion in 1866, a wave of anti-foreign and anti–Christian nationalism swept through the country. John-Baptiste was enlisted to bring in French officials to help resolve the matter, but he was eventually swept up in the persecutions that followed, being arrested, tortured and murdered for his faith. Martyr. Bernard-Louis's father died when the boy was very young, but his mother raised him with a good Christian education. He entered the seminary of the diocese of Bordeaux, France at age 17, but health problems caused his studies to take a little longer than normal. He joined the Paris Foreign Missions Society in 1863, was ordained on 21 May 1864, and sent to the missions in Korea where he worked and died with Saint Siméon-François Berneux. Tortured and martyred in one of the anti–Christian persecutions. Lay-woman. Convert. Maid, friend, and fellow convert of Saint Perpetua. Martyred with her. 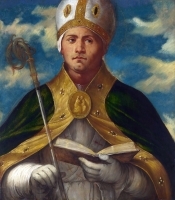 In centuries past their story was so popular that Saint Augustine of Hippo warned against giving it the weight of Scripture. Studied at the seminaries of Sables-d'Olonne and Luçon. Ordained a priest on 21 May 1864. Member of the Paris Foreign Missions Society, and assigned to missionary work in Korea. Tortured and martyred in one of the anti–Christian persecutions. Bishop of Soissons, France. Established several foundations, even getting the tyrant Ebroin, who cared nothing for the Church, to help establish a chapel for sick nuns. Mediaeval legend says that to spend the night at Drausinus' tomb made one invincible; whole platoons of soldiers used to camp out at the tomb the night before a battle. His patronage also helps thwart the plans of your enemies, and Saint Thomas Becket visited the tomb before returning to the treachery he knew awaited him at home. Born to the Northumbrian nobility. Soldier in the army of King Egfrid of Northumbria. Monk at Wearmouth Abbey at age 24 with his relative Saint Benedict Biscop. Ordained in 679. Succeeded Saint Benedict as abbot in 682. Noted for his gentleness to all and for living and working side by side with his brother monks. Mercedarian lay knight. Noted for his openness, charity and deep prayer life. In Tunis, while working to free Christians held as slaves by Muslims, he was scourged for expressing his Christianity publicly, but survived to return to Spain. Parish priest. Rector of Saint Ethelburga's, Bishopgate, London, England from 1504 to 1524. Rector of Woodford, Essex from 1526 to 1527. Rector at Chelsea, London. Friend of and imprisoned with Saint Thomas More. Executed with Blessed German Gardiner and Blessed John Ireland for denying that the King of England had supremacy over the Church, and for the crime of being a priest. Martyr. Travelled from Batanaea to Caesarea in Palestine to visit and minister to the Christians there. 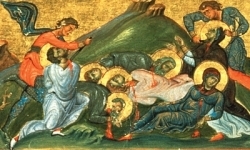 Martyred with Saint Adrian in the persecutions of governor Firmilian. Educated at the University of Cambridge, England. Secretary to the bishop of Winchester, England. Martyred with Blessed John Larke for refusing to recognize the spiritual supremacy of the King of England. Farmer. Upon the discovery of his wife's adultery, Paul became a desert hermit. Spiritual student of Saint Anthony the Abbot. Given the title The Simple for his simple and humble acceptance of the teachings. Received visions, and known as a miracle worker. Married layman in the apostolic vicariate of Vientiane (in modern Laos). Martyr. Monk at the abbey of Aniane, France, taking the name Ardo. Director of the abbey schools. Travelled with Saint Benedict of Aniane, served as his secretary, and wrote his biography. Abbot at Aniane. Married layman catechist in the apostolic vicariate of Vientiane (in modern Laos). Martyr. Priest. Chaplain to Blessed John Larke and Saint Thomas More. Rector at Eltham, Kent, England from 1535 to 1536. Martyred with Blessed German Gardiner and Blessed John Larke for denying that the King of England had supremacy over the Church. May have been a priest. Joined the Franciscans and travelled with Saint Francis of Assisi in the early days of the Order. Monk of Helmarshausen in modern Bad Karlshafen, Germany. Monk and head of the abbey school at Stavelot, Belgium. First abbot at Reinhausen, Germany in 1130. Bishop of Prusa, Bithynia (part of modern Turkey). Opposed the iconoclasts, and for his trouble he was exiled to Egypt where he spent the rest of his life. Sixth century founder and abbey of Bodfari Abbey in Clwyd, Wales. A catechist and three students martyred together for teaching and learning the faith. We know little more than their names - Revocatus, Saturninus, Saturus and Secundulus.